A custom made steel gate in a copper hue separates this side yard from the back yard. The back yard of Jennifer Shelhouse’s townhome was in dire need of a redo. It was cramped, linear and not particularly user-friendly. The “before” back yard, with its wood decking, was very dated and required a lot of maintenance. Walking out the back door to the yard felt like walking into a narrow hallway. Plus, there was a hill that went up about 4-5 feet. “It was multi-tiered and didn’t work or flow well and wasn’t very usable,” says Jennifer. Adding to that was an air conditioning unit located on the back patio, which was loud and took up space. 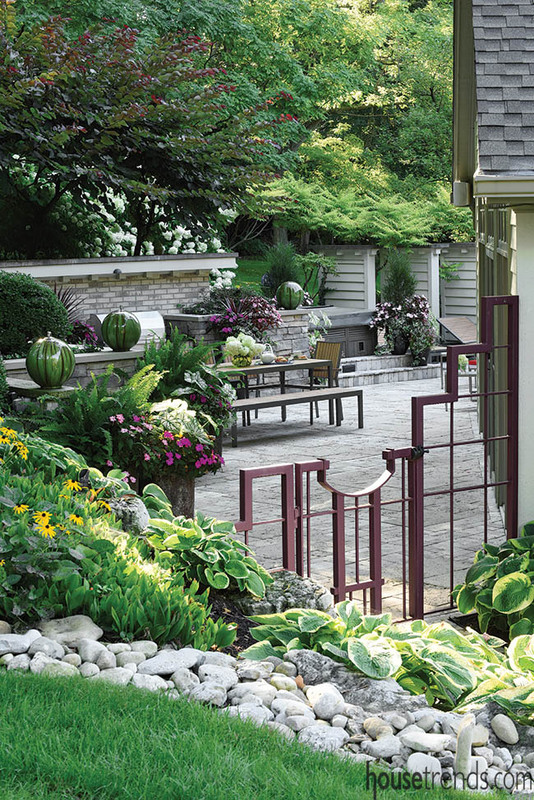 Jennifer retained Fullmer’s Landscaping in Dayton to help design a functional, uncluttered and charming back yard; the property design earned the company the 2011 Merit Award for residential design via the Association of Professional Landscape Designers. The contractors first dug out the hillside and put in a retaining wall. When the hillside was torn up, it completely changed the geometry of the landscape. “It switched from being parallel with the house and instead made everything line up in a 45 degree angle,” says Reuben Huffman, Landscape Designer with Fullmer’s Landscapers, who was the project lead. 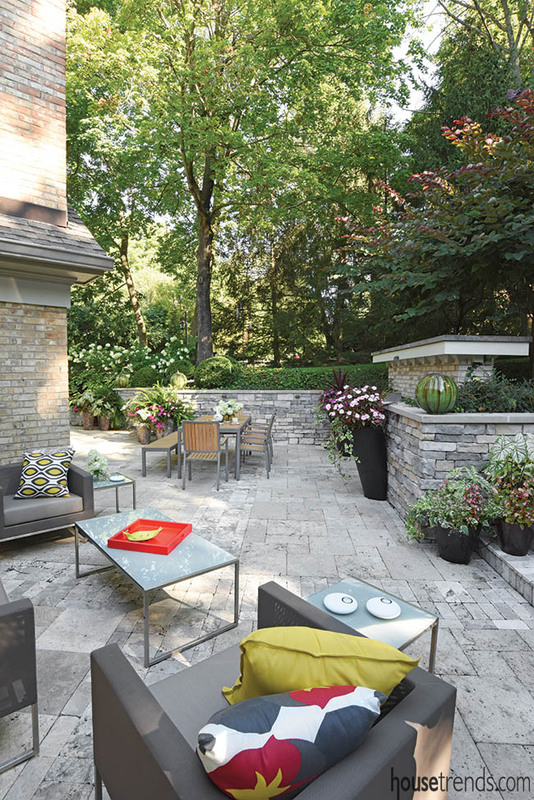 Fullmer’s tore out the existing deck and built a concrete block wall, enveloped by limestone boulders, which were locally quarried. “The manmade ledge rock veneer on the wall was chosen to blend in with those boulders on the ends,” says Huffman. 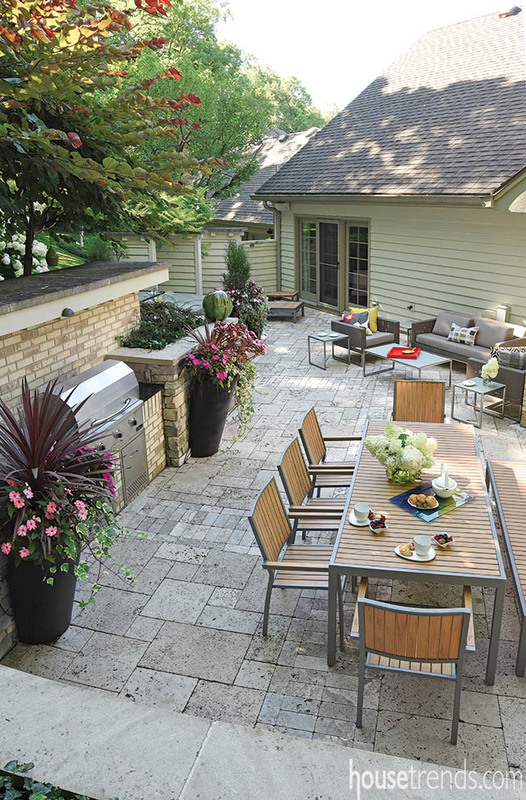 The small back yard was spacious enough to arrange in intimate zones—one for dining, one for sitting and a hot tub area—a planning element that Jennifer loves. 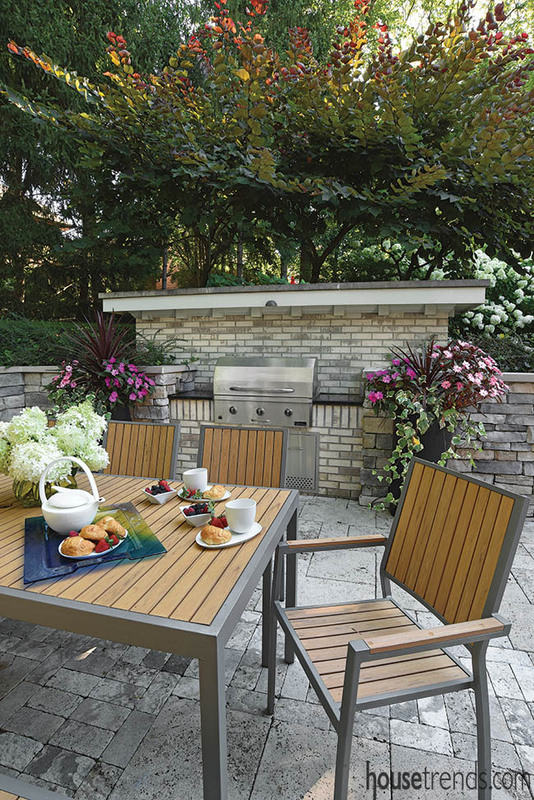 A partial outdoor kitchen was created: a grill with a brick backdrop and a roof overhead, using the same brick as was used on the home. “One thing I aim for is making it feel like it was part of the original design instead of something tacked on later. By using the same kind of brick out at the grill to build that structure, it makes it feel like it belongs with this house,” says Huffman. 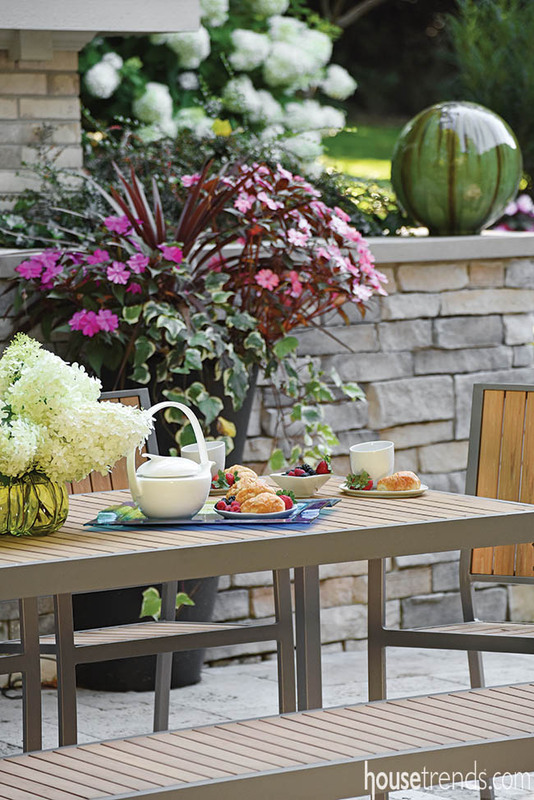 Jennifer opted for a travertine patio, a favorite material of hers, referring to it as “…neat, natural and a nice color variation.” Plus, travertine is known as a durable tile option. From the center of the outdoor grill, tiles were laid out subtly with smaller sized pavers to create a gridwork pattern within a pattern. Lending an air of tranquility to the space is the calming water feature addition in the living area. 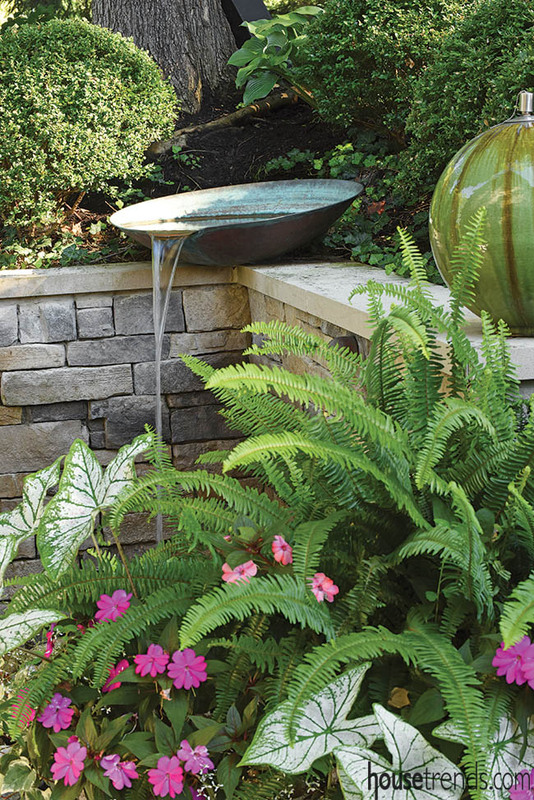 It was important that not only the water feature provided soothing sounds but that it was a natural look. “I didn’t want it to look like a purchased fountain; the bowl is copper. 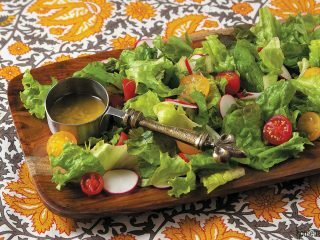 I love copper; it’s a nice material and over time it get a beautiful green patina,” she says. Plus, Jennifer felt that copper went well with the other natural stones used and fits in with the overall design. “It is like a blend of modern shapes but using natural materials; I like the interplay between those two things,” she observes. Huffman and his team ended up bending the rim of the copper bowl down to recirculate the water down into the river stones below. 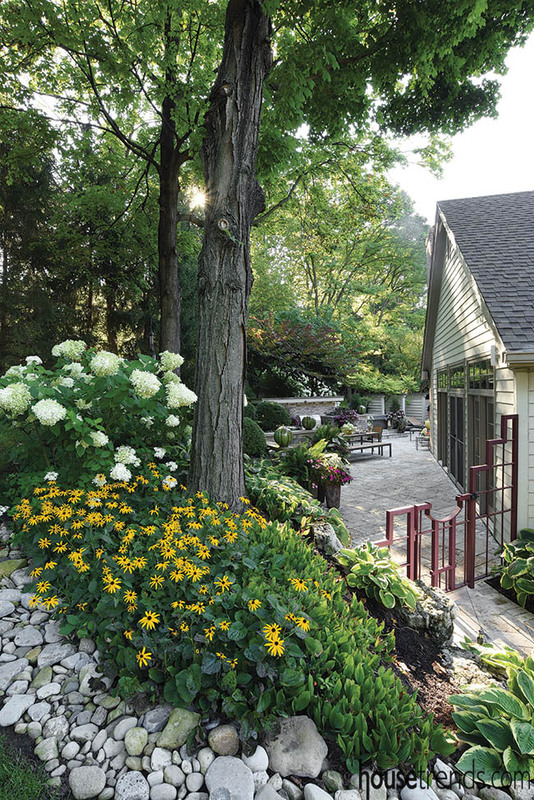 The intricately planned landscaped grounds played a major role in the back yard’s transformation. 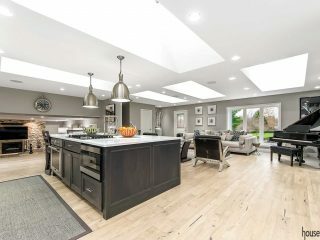 “The owners were looking for a relaxed elegance, with sharp corners and crisp edges accentuated with soft flowing plant material all around it,” says Huffman. The plant life in and around the yard, front and back, is a combination of species and colors, designed to thrive in multiple seasons; some plants and trees were held over from the previous back yard and others were newly planted. 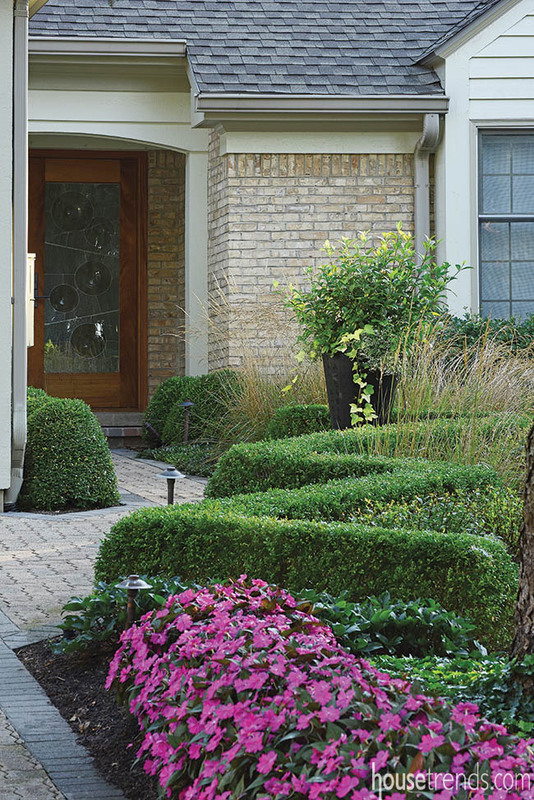 In the front yard, along the angle of the walkway, is green velvet boxwood, trimmed into a zigzag hedge. For example, Huffman preserved existing boxwoods, but relocated them in a half circle behind the water feature. With the predominant colors green, chartreuse and purple, he put in forest pansy redbud trees behind the grill. 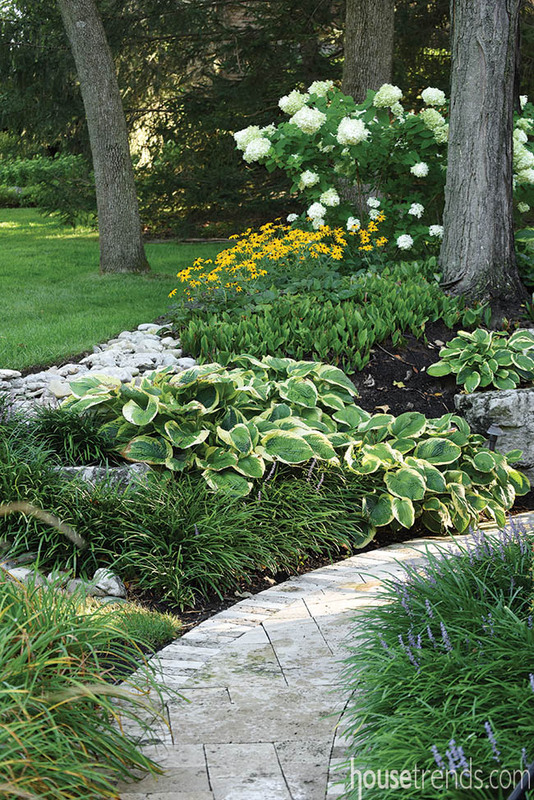 And right before you walk into the back gate, he planted hostas with dark green leaves and a chartreuse band around the edges. 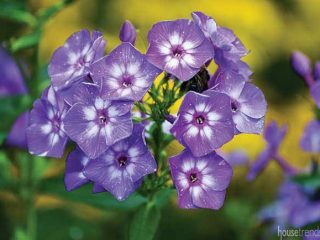 Now that the hillside is much less intrusive, it serves as the nesting spot for such plants as black-eyed Susans and hydrangeas. 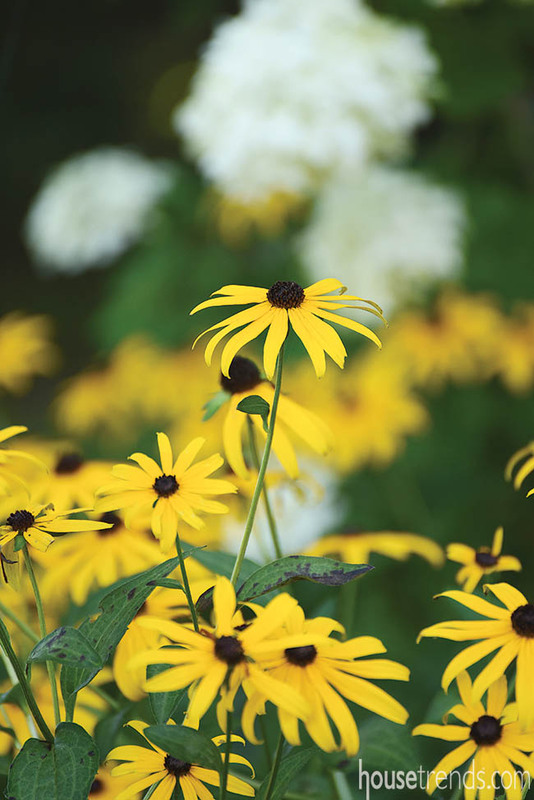 “I love the textures and color combinations of those two plants together,” says Jennifer. 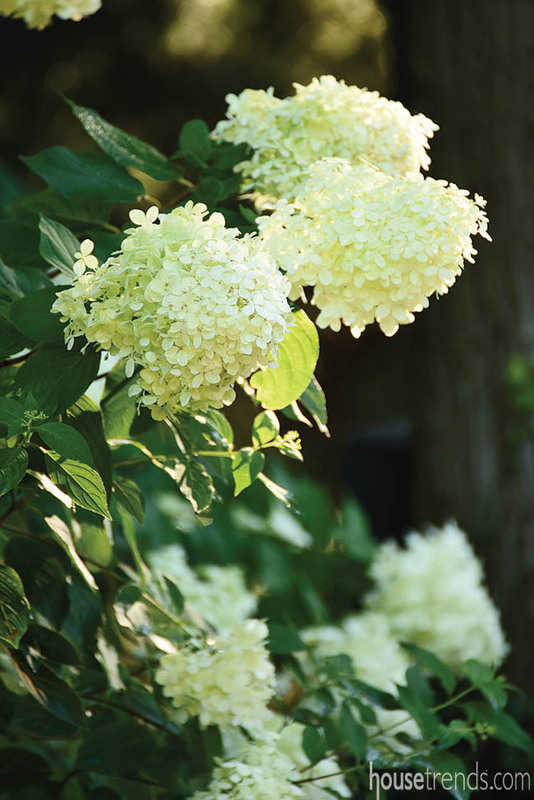 She also likes the pretty mix of variegated and non-variegated species. 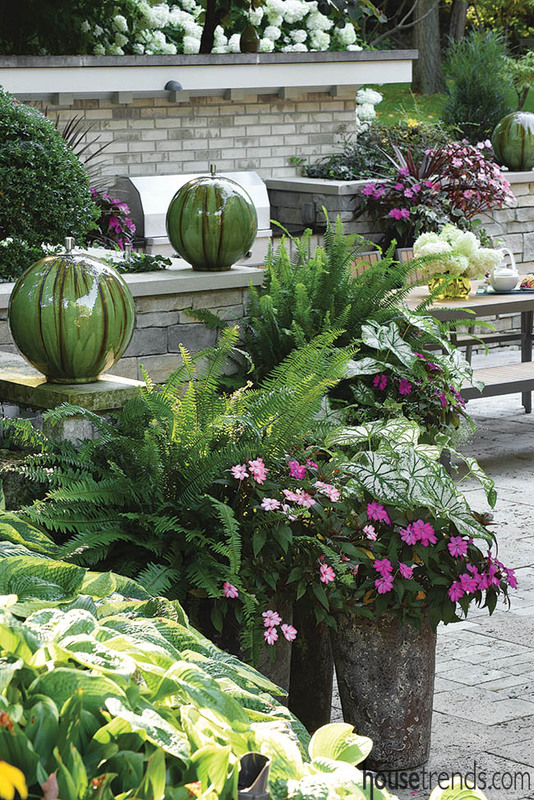 And with the variety of containers dispersed throughout the back yard, the landscapers are able to come in and change out the plants seasonally. At the far end of the patio by the hot tub area are three custom-designed screening panels, and several Tiger Eyes Sumac trees. “These give a chartreuse/greenish yellow pop of a tropical looking leaf that peeks out from the panels,” says Huffman. 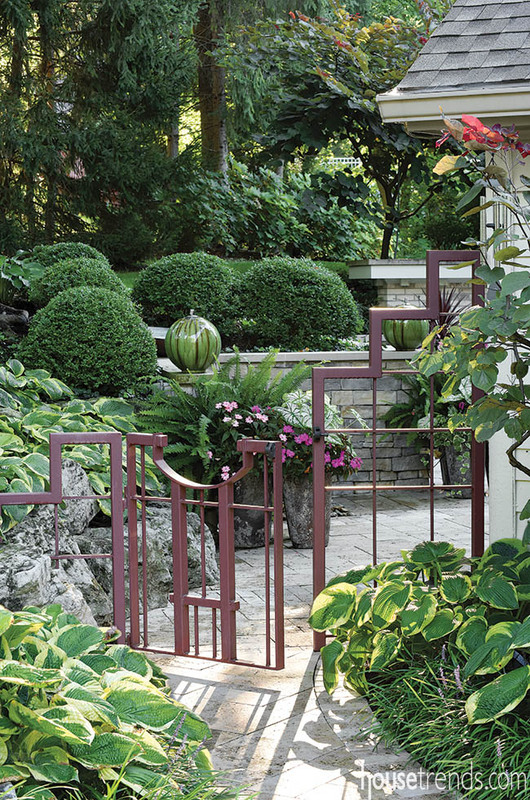 The landscapers also installed a custom steel gate, made of a coppery square metal tubing, allowing for an inviting, though private, entrance to the back yard from the side yard. 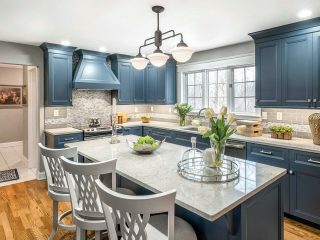 Resources: Architect: Jennifer Shelhouse, AIA; Landscape designer: Reuben Huffman, Fullmer’s Landscaping, Inc.; Landscaping and hardscapes: Fullmer’s Landscaping, Inc.